Recovering after a run is one of the most important aspects of training. Running makes your legs strong, toned, and, unfortunately, tight. Every step you take forces the quads, hamstrings, calves, and hips to flex and extend over and over to propel you down the road, trail, or track. After many miles, those hardworking muscles and tendons can develop imbalances, scar tissue, and tension, slowing you down and paving the way for common overuse injuries like IT Band syndrome and Achilles tendonitis. The time to deal with running injuries is before they occur. However, most runners wait until the first pinch in their glutes, pain on or around the knee to start researching terms like piriformis or plantar fasciitis. Stretching not only increases flexibility but can also be a vital way to avoid injury. I always start my post run recovery with some static stretching for about 15 minutes. I stretch my major muscles groups. I focus on my quadriceps, hamstrings, IT band, upper and lower back, groin, and hip flexors. I slowly ease my way into each stretch and hold it for 45 seconds. I then take a 30-45 second break and then do the same stretch again before moving on to a different stretch and muscle group. 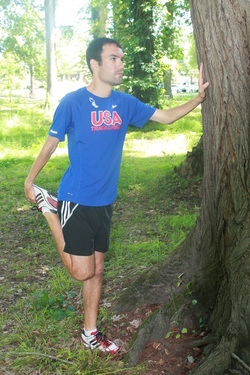 There are a lot of stretching information online but Runners World has a great list here, Flexibility Training. Here is a good site with step by step instructions on static stretching. After stretching I drink a carbohydrate and protein recovery drink with at least a 2:1 carbohydrate to protein ratio. According to a 2006 study in Medicine and Science in Sports and Exercise, eating carbohydrates and protein together increases glycogen levels more than eating just carbohydrates. The body is more receptive to getting carbohydrates and proteins back into the muscles within 30 minutes of finishing a run. Intake of 1.0-1.5 g CHO/kg body weight (.4-.7 g CH0/lb body weight) within 30 minutes of exercise increases glycogen storage and decreases recovery time when compared to ingestion two hours after exercise. My personal favorite and go to post run drink is chocolate milk. 16oz of chocolate milk has 54 grams of carbohydrate, 18 grams of protein, 460 milligrams of sodium, and 16 grams of fat. There are several recovery powders on the market you can mix with water or milk. Endurox R4 Recovery Drink mix is another favorite of mine. It has a 4:1 carbohydrate to protein ratio. It can be bought at most running stores and online at Running Warehouse and Road Runner Sports. One final drink mix that I've recently started using is Generation UCAN. One packet contains 33 grams of carbs, 13 grams of protein, 240 milligrams of sodium, no added sugar, and just 1 gram of fat. 2014 Boston Marathon winner Meb Keflezighi uses UCAN. If you prefer solid food as a recovery meal try the Cliff Builders Bar or Honey Stinger 20g Protein Bar. Foam rolling is part of my post run recovery as well. I typically foam roll two to three times a week after long runs, intervals, and tempos. I prefer the Trigger Point Grid roller. 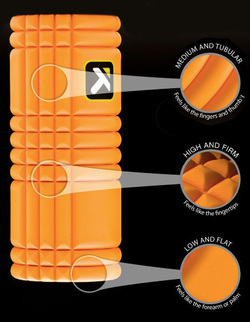 The Grid has a unique design allows for targeted massage as opposed to other foam rollers on the market. The Grid has a PVC core meaning the foam won't break down overtime like cheaper foam rollers. It makes for a great Myofascial Release, a form of massage that addresses the muscle spindle and the associated dysfunction such as trigger points, adhesions, and other muscular challenges. This process also retrains the pattern of movement by opening up the neurological pathway allowing greater muscular proprioception. The Grid can also be used to achieve a comprehensive core body workout from crunches to bicycles to push-ups. This video has 3 great foam roller exercises that can be done on The Grid. Another self massage tool I like to use is The Stick. The stick increases flexibility, accelerates recovery, reduces muscle soreness, stiffness, and pain. Similar to a foam roller but easier to do and you can control the pressure better using your arms and hands instead of body weight. The correct stick for an individual can be determined by a combination of that person's size, muscle density, pressure preferences and how the stick will be used. So, to help you choose the right Stick for you, they have created the Stick Selector. I use the sprinter stick because it is less flexible than the others and I feel it gets deeper into my muscle. The travel stick and marathon stick are favorites of several of my running friends. I think it works better when you can relax and let someone else massage you with the stick. Compression gear can also aid in the recovery process. Compression apparel applies external pressure to the muscle groups. The most effective products apply graduated pressure, which reduces from the foot or ankle up the leg to the hip. Compression sleeves have pin-point compression which promotes blood flow, increases lactate flushing, faster muscle repair, and reduces muscle fatigue and recovery time. I prefer the Zensah leg sleeves. I tend to sleep in mine the night after a hard morning tempo, intervals, or long run. They help alleviate tightness and soreness. Compression gear can also help stabilize your joints, especially your knees, during running. You may have to get specially fitted for compression gear so I recommend going to a running specialty store. One final tip, do not pop ibuprofen and painkillers post run or pre-run so you won't be hurting during your run. "There's nothing inherently wrong with inflammation," says Tom Etges, a family physician and acupuncturist based in Eugene, Ore. Yes, you read that right, ibuprofen junkies. "The body is a lot smarter and more elegant than we give it credit for, and up to a point it will repair the damage if you let it," Etges explains. The medical community warns overuse of an anti-inflammatory medication can interrupt the normal healing process and cause liver damage. It can also cause a false sense of relief, so you're more likely to challenge yourself before you're recovered and ready. If you're in enough pain that you feel pain killers are your only option than perhaps you need a break from running or at the least a cut back in intensity and mileage. I would also recommend seeing your Doctor and a physical therapist. Instead of forcing out potentially helpful inflammation, aid your body in flushing out superfluous inflammation. Drink plenty of water, elevate your legs above your heart for a few minutes whenever you get a chance, foam roll, increase your protein intake, and consume more anti-inflammatory foods. Whole grains, healthy fats from avocados and nuts, beans, leafy greens, and wild-caught fish promote an anti-inflammatory response in the body without the potentially long term damage of pain killers. Don't neglect your post run recovery. It is impossible to prevent all running injuries but a simple post run routine can go a long way toward keeping you healthy. A good post run routine should take about fifteen minutes, such as this one developed by Jay Johnson. For those who complain that running takes up too much time already, let alone adding a post run routine, I give you John Wooden: "If you don't have time to do it right, when will you have time to do it over?" Although I am a certified Health Fitness Specialist and have a BA in Exercise Sport Science the advice presented here is strictly that, my own advice and recommendations based off of my personal knowledge and things that have worked for me in my training. Consult your own Doctor or physical therapist before trying a new exercise regime.